If they're a standard, single electrode model that's been in use for 90+ years, they must be gapped or you won't have an engine that runs right. If you mean plugs like in Cluff's picture then no, they don't get gapped. lol those don't get gapped, but I'm not referring to funky ends like that. I'm referring to the same single-electrode plug that's been in use for damn near a century. Any ACDelco or some NGKs will say specifically on the box, PREGAPPED TO .060, DO NOT RE-GAP!! My local napa told me to not do it either, evidently on ACDelcos at least it voids any plug warranty. 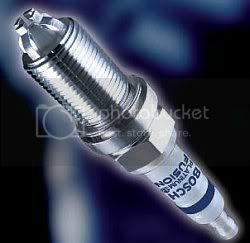 I got Bosch iridium, because NGK doesn't make them for me. The best and most effiecient plug for that jeep is a Champion Copper resistor they will make more power but need replacing every 30K. NEVER gap a p[latnim or iridium it strips the coating and defeats the purpose. Plus what's the real savings a Iridium cost what 6.99 a champion resistor cost 1.49. Tune up on a iridium is 100K with good motor for 6.00 worth of resistors you can get 120K. Also the RC12LYC Champion Resistor is the Original Equipment Manufacturer part just like it came from Jeep. Keep in mind im not a Champion fan boy I actually prefer NGK, AcDelco, and Pulsar. When I need a cheap plug it's usually a Autolite or NGK. Except in Older Dodge motors I only use Champion. In newer dodge motors I use NGK because most are from Mitsubishi Motors. Last edited by lautinjr; 04-15-2010 at 03:02 AM. Heh, never heard that. I've heard Champions are good in Dodges, but nothing else. Well... Every car I've owned so far has come with non-iridium plugs. And everyone here I've talked to has told me they are performance plugs. Copper is the budget plug. It just doesn't make sense. I have heard around on jeepforum that using platinum plugs on a 4.0 can cause erratic idle, hesitation issues, and odd operation in general. I have my jeep lightly modded (need.... more.... power), and if I could gain power or economy by switching from my factory RC12YC plugs then I would have long ago. With just a few mods you can have 200hp and 280 lb/ft of tq (at the crank), and have a very reliable old engine. Intake, exhaust, and fuel are areas that could see gains from mods. Take a look at my sig to see what I've done to my jeep so far. If you're ever thinking of needing more power than basic bolt ons can provide, just pm me.